Some of my readers may remember my hair disaster about four weeks ago, when I went to my regular hairdresser and requested a dark auburn color and my hair immediately (mistakenly) turned black. I had to wait things out, #1 to protect my hair from further damage from the coloring, and #2, money. Some women might have run out and bought a package of Clairol or Revlon to fix it, which I actually did that day, but I tested a small strand of my hair with it first and it didn’t affect it at all, other than lightening it just a little. I didn’t want to do it for nothing, or worse, ruin my hair and come out of the bathroom with orange hair. Yesterday I was finally able to go to a different hairdresser in town to get it professionally fixed. I am extremely happy with it. She did a great job! Yes, I was nervous. It didn’t help that at first, the hairdresser seemed nervous about it, too. I was a new client, so she wasn’t sure exactly what I’d like. I explained several times what I wanted, as I had the day I made the appointment. Forget my sudden, hormonal desire four weeks ago to go dark auburn. 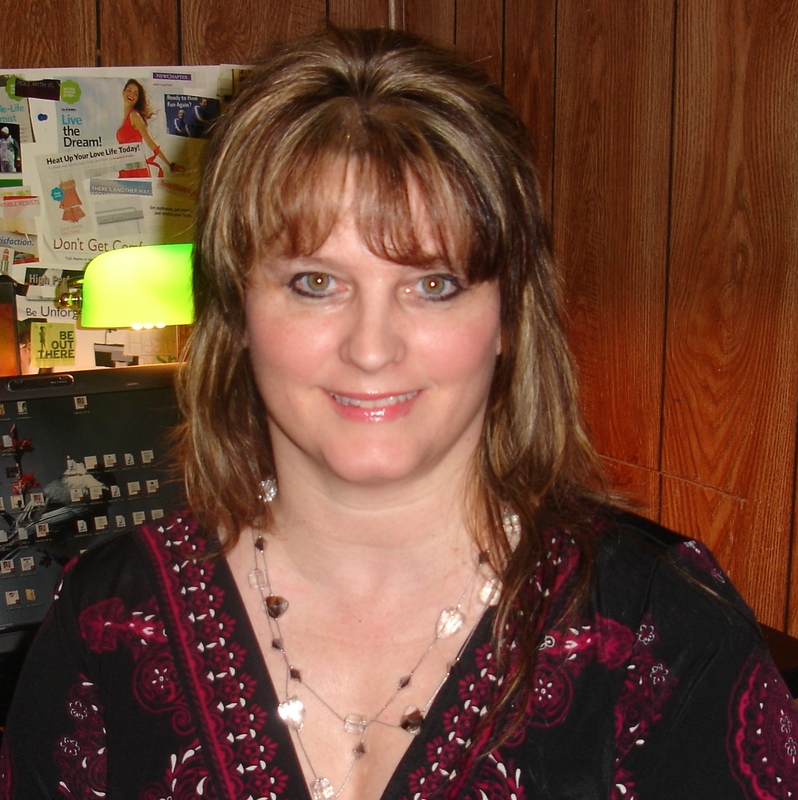 I now wanted it back the way it was – my natural brown color, with blonde highlights. It was getting the shade back to brown that was the biggest challenge, and thus began my trial in patience. First, the hairdresser had to strip the color (the black). This changed my hair into an auburn-red color, making me realize that auburn was really NOT what I wanted after all. Just wasn’t me. Then she set me under a dryer for awhile as she did another haircut. I watched incredulously as an older woman had most of her hair shorn (the woman’s request). She left very happy to now look like a man. Next the hairdresser wrapped some of my hair in foil for the blonde highlights. By this point I’d been in the shop several hours, and my patience was wearing thin. More people came in to get their hair cuts. I know hairdressers have to make a living and also have to accomodate people for appointments, but I was getting hungry (hadn’t eaten all day) and just wanted it DONE! I was anxious that my base color was still red-looking and needed a visual of the finished product. When she unwrapped the foil and rinsed it out, the top part was brassy looking (orangish-red instead of blonde). This time I put my foot down. Remembering that I am a Christian speaker and writer, and that I really shouldn’t scream in public at people (or privately! ), I said, “I’m not trying to be difficult. BUT PLEASE FIX IT!” The other hairdresser (supervisor) came over to look at it and asked if I just wanted to “tone it down.” I was emphatic. “NO, I want it redone on top where it’s brassy.” The rest of it was fine. She wrapped the brassy strands of hairs in foil, and applied more to highlight it, and this did the trick. She and I were both very happy with the result. (I gave her a great tip!) The blonde highlights gave it a nice contrast to the base color, which is a little redder than my natural brown color, but much closer than the black! By the time I left the shop I had been there FIVE HOURS. Was it worth the time and the money? You bet. Was it hard for me to wait that long? YES! Patience has never been one of my virtues. Lately it seems God has me waiting a LOT. My ebook on women and spiritual warfare has been taking MUCH longer than I anticipated to finish – I worked hard on the writing and editing this week, and now the only thing left to do are the technical aspects so my new deadline is the 4th week in May at the latest. After my ebook was taking longer than expected, it was my hair disaster, which I had to wait four weeks to fix. Then yesterday Ray decided he wanted to eat before going into work at 7 p.m. for his shift, and I had to wait on him to finish eating his fish sandwich. (We have just one car, so I have to drop him off at work to have the car.) It seemed as if he was eating the fish sandwich as slow as possible – or is it just my impatience again? When I googled it, I laughed at this quote, “Don’t be an amber gambler.” A ticket is supposed to be issued for a RED light violation. A yellow light is a warning to slow down or yield. If it turns yellow before you get to the intersection, technically you’re supposed to hit the brakes. If it turns yellow after you’re in the intersection, obviously you proceed. But it’s wise NOT to run yellow lights because there are always “light jumpers.” There are other impatient people, like me, who see the yellow light as a personal challenge to get through the intersection as fast as possible, so they don’t have to wait. I am joking, of course. I don’t endanger my kids’ lives (or others), but it IS annoying to wait at red lights for long. Like I said, it seems like I have to wait a lot. When I go to the speed lane at Walmart or the grocery store, there is a cashier who is slow as molasses on the register. Even if it’s a 22 year old popping her gum. Another example of a test of my patience: Our kids always seemed to take as long as Christmas when they were getting up and dressed in the mornings. Our daughter Heather gets annoyed at her kids getting ready for school in the mornings, “They’re soooo slow!” she says. Her oldest daughter Annabelle especially loves to dawdle and to take her sweet time getting out of bed, eating her cereal, brushing her teeth, tying her shoes, etc. When Heather has complained about this, I’ve laughed remembering how Heather used to do this to me. What is that expression about paybacks? LOL. 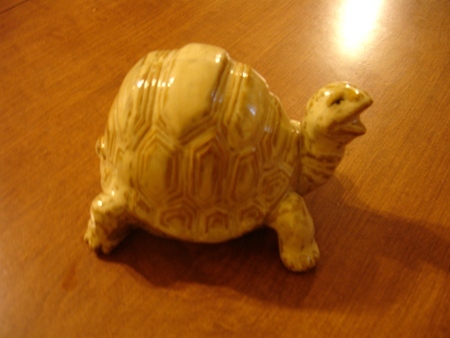 The gift was a ceramic turtle. Ray is a turtle, and I am a racehorse rarin’ to go, chomping at the bit to get out of the starting gate. A farmer doesn’t plant some corn or other vegetables one day and go out the next expecting to see the crop. He has to patiently wait for the rains, the growth, then the harvest. What about you? Do you struggle with patience? Share some of your stories. Leave your comments below. Are you impatiently waiting for my new ebook to come out? Me, too! I am working hard on it. Be sure to sign up for my update list at http://www.bethjones.net (on the right sidebar, under the little red pencil), so you’ll be first to know about it coming out and so you’ll receive the special 25% discount off its price – you get first dibs if you’re on my update list, before anyone else even sees it!